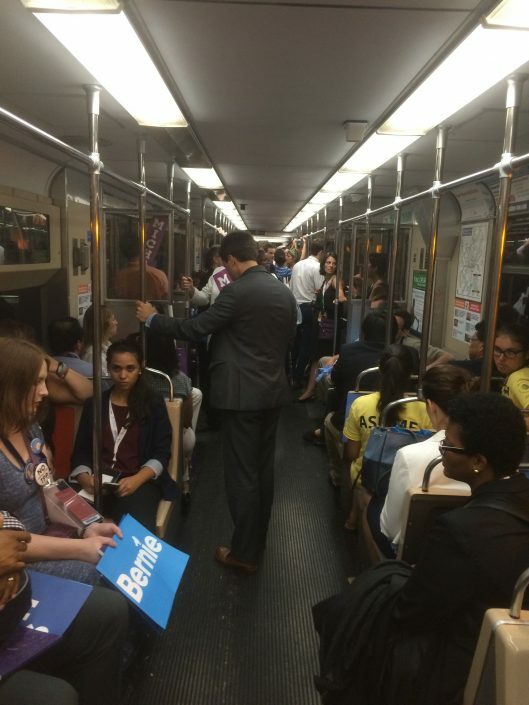 Note to Democratic National Convention-goers: That means you should take the Broad Street Line to get to the Wells Fargo Center. 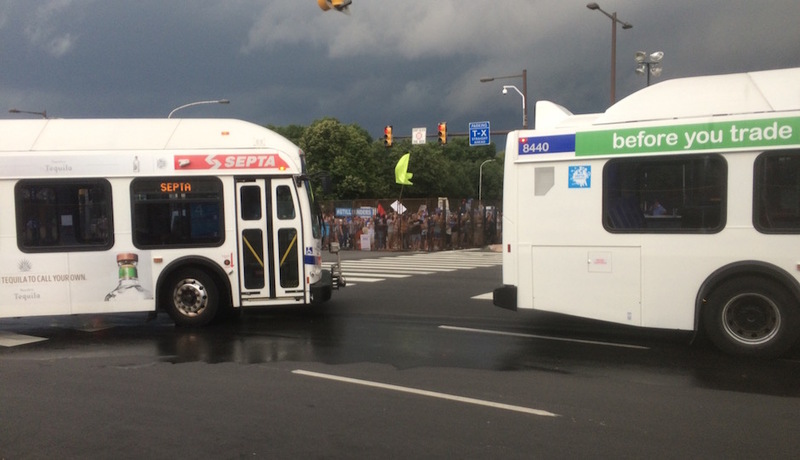 A completely unscientific survey of delegates and other attendees during last night’s opening session revealed a significant satisfaction gap between those who relied on SEPTA’s shuttle buses and those who used the subway to get to and from the convention site. The chief complaint about the shuttle buses: long waits in the hot sun — or the pouring rain. “There were fights breaking out because people couldn’t get on the shuttle buses,” said Mark Meizis, a Clinton delegate from Kansas City, Mo. “There were people standing in the sun from 2 to 4 p.m. waiting for buses. 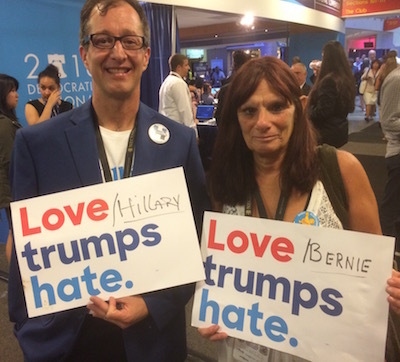 Moses Ross (left), a Clinton delegate from Portland, Ore., and Lisa Stiller, a Sanders delegate from Beaverton, Ore., offered a show of unity to conventioneers last night. Stiller loved the helpful attitude of the SEPTA personnel who helped her use the subway when she arrived on Saturday but didn’t much like the two hours she had to wait for a shuttle bus on Monday afternoon as full buses passed her waiting group by. 12:30 am: Thousands still in gridlock trying to leave Wells Fargo Ctr. One-hour-plus wait for Uber. Shuttles MIA. Worst. Convention. Ever. 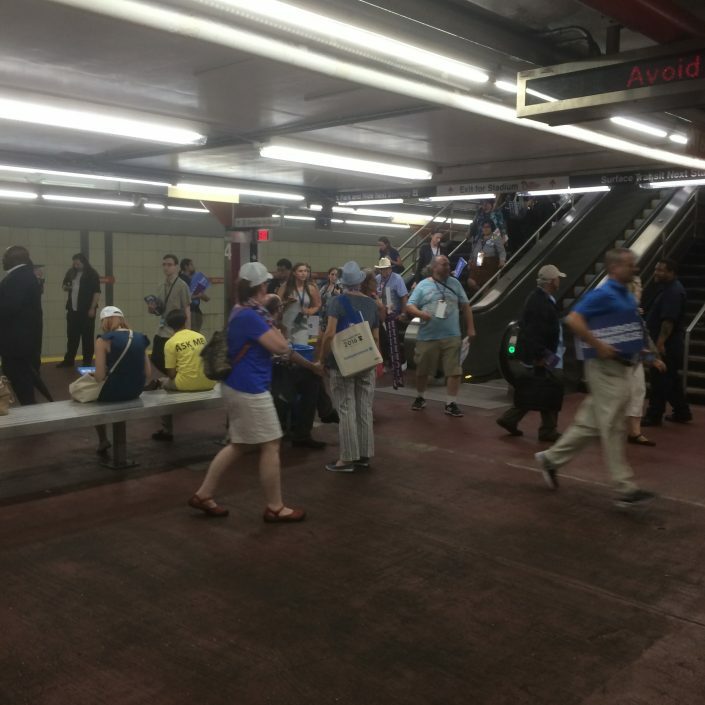 Those who chose the subway to get to the convention site generally had a better experience, even those who were slightly disoriented as they found their way to the subway station platforms. “City Hall is a weird station. And it was abandoned,” said Adam Parsons, a Sanders delegate from Ohio who caught a train to AT&T Station there at 2 p.m., before the rush began. But even though Parsons hailed from Columbus, which has no subway — the only Ohio city that has one is Cleveland — he noted, “Really, there were a lot of people who don’t know how to use subways” at the convention. Not including him. 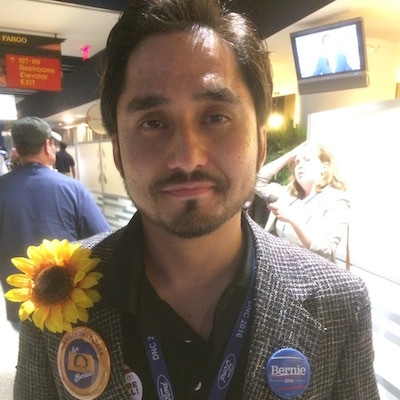 Shaher Ibrahimi, a Sanders delegate from Lawrence, Kan., started out by attempting to take a shuttle bus from a meeting with the Vermont Senator, but “the bus, I guess, couldn’t get here because the protesters were blocking the buses,” so he went over to City Hall station to catch the subway. “It was pretty good, uneventful. It was a little hot, but no complaints,” he said. Had Milbank followed the lead of New York Times columnist David Brooks and taken the subway back, he might have spared himself the exasperation. 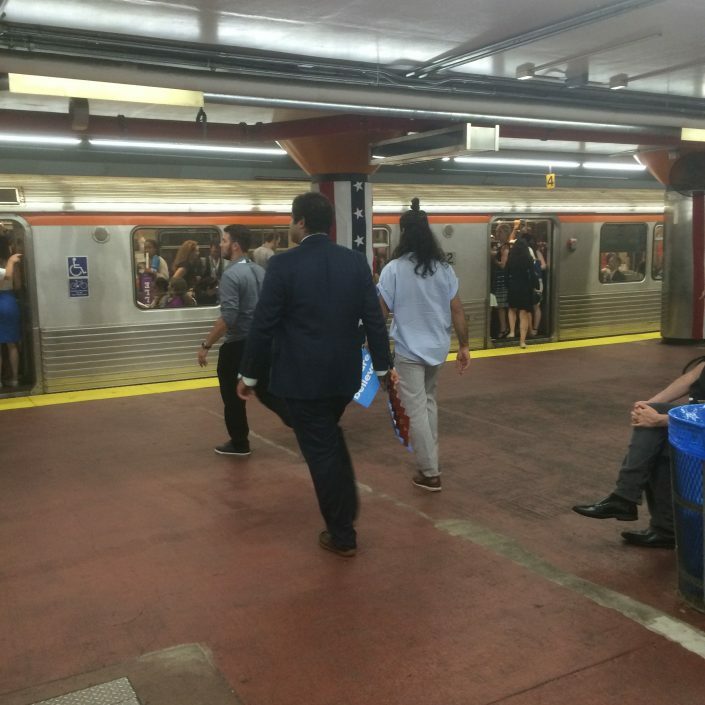 SEPTA personnel inside AT&T Station guided patrons to waiting subway trains — which were plentiful, as the platforms at AT&T can accommodate two five-car trains on each track — and made sure the trains were as full as they could possibly be before dispatching them. It may have been the first time in Broad Street Line history (non-sports-related division) that one could see trains packed to the gills with standees; the line usually carries far less than the traffic it can handle. 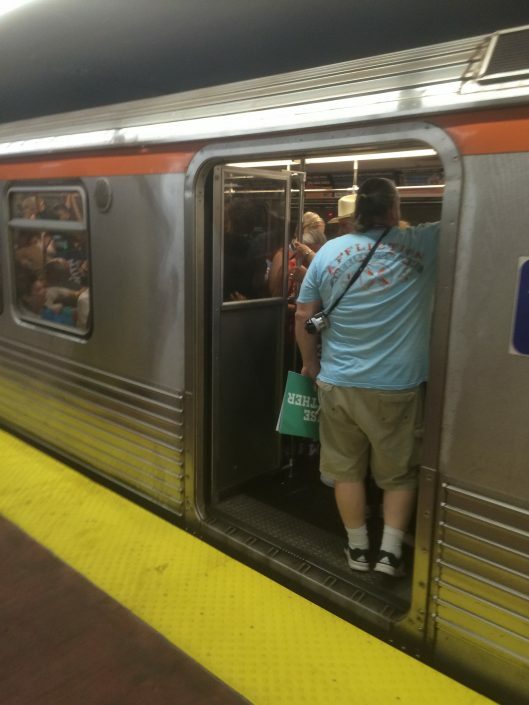 Broad Street Line trains, which had been parked at stations along the line after the day’s regular express service ended at 7 p.m., arrived and departed frequently as well. 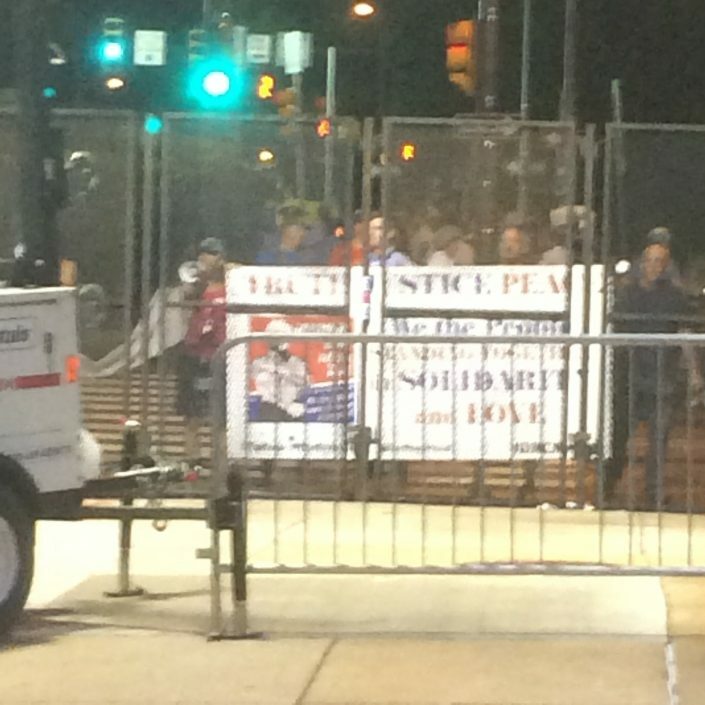 According to SEPTA, yesterday’s service disruption on the Broad Street Line between Oregon and AT&T stations should not be repeated; the Philadelphia Police requested the restriction as they dealt with a Bernie-or-Bust protest directly above AT&T Station. As was the case yesterday, SEPTA will add extra express trains southbound from City Hall in the afternoon hours to handle convention traffic. For those not familiar with the system, finding your way to the subway may seem intimidating, but SEPTA staff (look for the bright yellow vests) should be able to assist you. 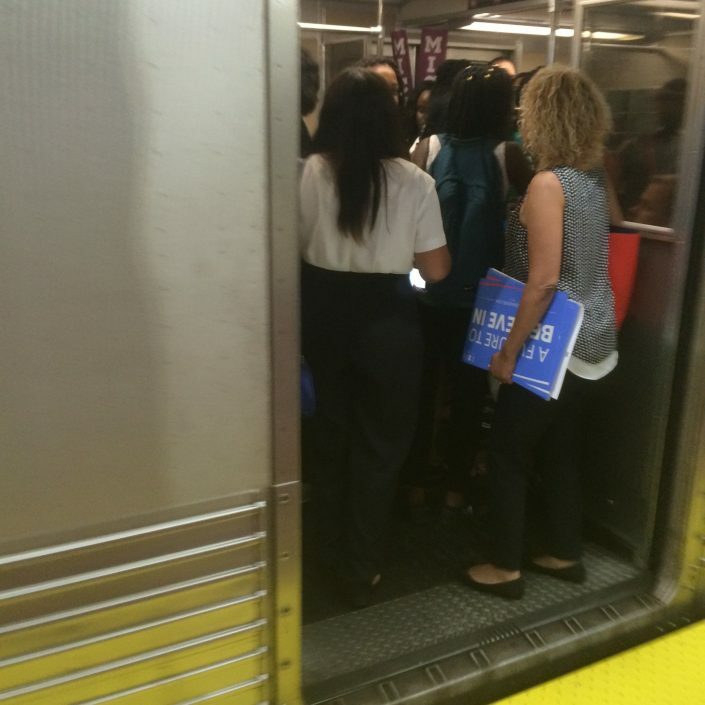 In the meantime, for those who still prefer not to deal with the masses on ordinary mass transit, my recommendation is: Pray the Bernie-or-Busters stay out of the street this afternoon. Maybe then, you’ll have a fighting chance of getting on a shuttle bus in a reasonable period of time. Conventioneers proceeded in an orderly fashion to the subway and shuttle bus pickup points. Some bus riders groused about nonexistent shuttles. 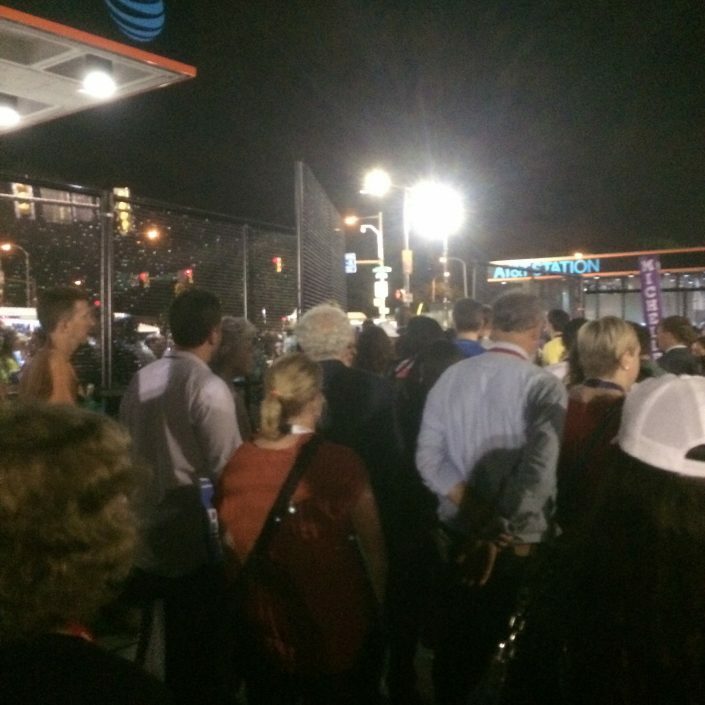 After the evening's storms had passed, a group of diehard Bernie-or-Busters came back to press their case to conventioneers headed for AT&T Station. Inside the station, SEPTA personnel guided passengers to waiting trains. AT&T Station had plenty of room to handle the crowd. A rare sight: a packed-to-the-gills Broad Street subway car. ...but some riders didn't make it to the cars furthest down the platform, as this partly full car indicates.